SinFest IV Heavy Metal Culture Festival DETAILS and DIRT! | Badass Concert | Heavy Metal Music News | So METAL, we piss RUST! Home News SinFest IV Heavy Metal Culture Festival DETAILS and DIRT! Who is ready to party? Surely you’re ready… I mean it’s the annual monster gig with FREE KEG BEER (While It Lasts)! Wondering what kind of beer will be served, well don’t… it’s FREE! The time has come to prepare for the annual SINFEST Heavy Metal Culture Festival. We recommend your training consists of mild binge drinking and practicing looking up and not at your phone. This year marks the fourth annual concert. We’re proud that this concert has been around that long. With that in mind, it’s going to be the BIGGEST SINFEST yet! It’s the most super f*cking metal event Norfolk has to offer. We have six bands performing LIVE and four artists on-location! The lineup consists of Sin/Fixx, The Blood of War, BloodRail, Architect or Arsonist, Surveying The Damned and Devil In The Details. It’s loud heavy metal at it’s finest! In between bands the show goes on. Make your way to the “Huge Beer Garden Artwork Exhibit” provided by… Dillon’s Diabolical Designs, Brittany Hinkel, Chelsey Thomson… PLUS THE RETURN OF B.Grim! There will be a special guest opening performance by SPLIFF. So mark your calendars now for August 8th, 2015. It’s going down at one of Nebraska’s most excellent venues, The Depot, in Norfolk, Nebraska. The Depot is located at 211 Northwestern Avenue, right next to the train tracks. Go ahead, RSVP on Facebook, all the hip kids are doing it!!! While we’re at it, let’s recognize your local area sponsors. We have Dillon’s Diabolical Designs, Aorta Music Management, The Depot, Gillette Printing and Clenched Fist Productions. 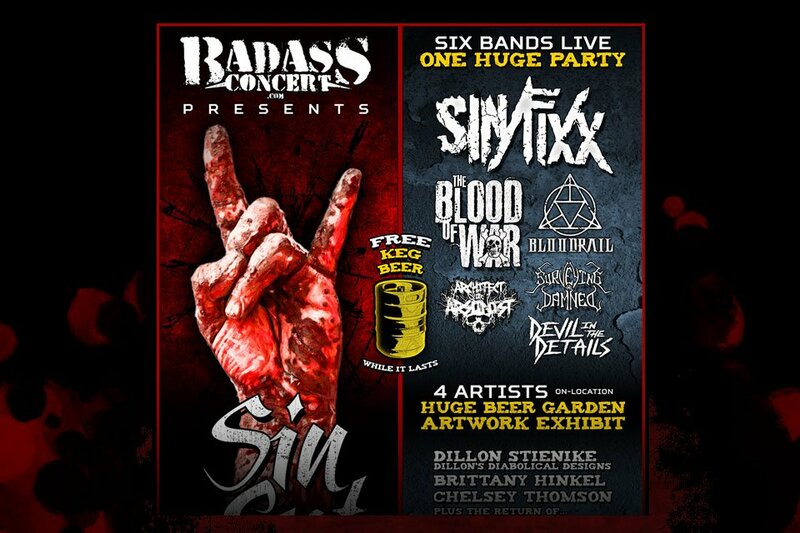 SERIOUSLY A HUGE F*CKING SHOUT OUT to the Sin/Fixx crew. These guys break their backs organizing this annual massive gig! So there you have it! One huge heavy metal festival, in one of the state’s largest metal towns. After all, Norfolk is a “A Community Of Strength”… that’s pretty f*cking METAL! – Stay Metal and Piss Rust!